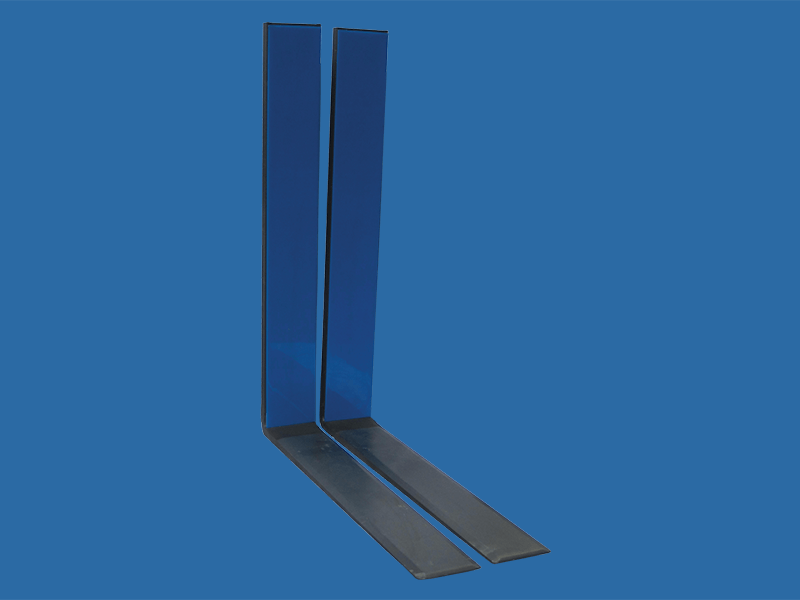 The unique blade design and slide-in urethane pad on the upright provide the optimum product protection when handling gypsum wallboard or other similar products. 1. Cascade's slide pad, either polyurethane or neoprene, is rated at 70 durometer. The hardness of the urethane pad is similar to that of an automobile tire. Replacement pads are available. The pads are impervious to grease and do not mark the sheet and are extremely durable. The 70 durometer pad is bonded to a steel plate for stability and rigidity. The slide-in feature of the pad makes replacement quick and simple, averting expensive down time. Hook or shaft type mountings are available to suit your lift truck. Bent and upset heel section. The blade is polished and all sharp corners removed preventing damage to gypsum board. There is a double-sided bevel at the tip for easy entry between gypsum sheets. Fork widths are normally up to 12" (300mm). Square corner-in heel prevents damage to edge of gypsum sheet. High back support is available.